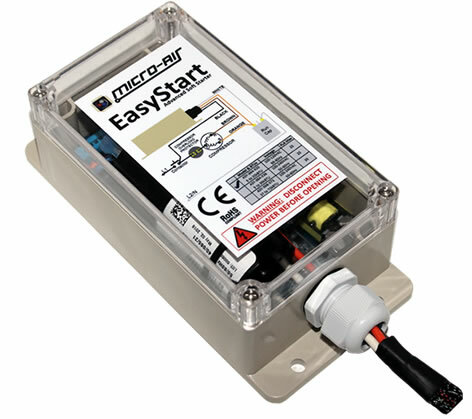 The EasyStart 364 Soft Starter For RV and Marine By Micro-Air, Inc.
What Can The EasyStart™ 364 Do For You? Why Run 1 Air Conditoner When You Can Run 2 Air Conditioners On A 30-Amp Cord! Now You Can Run Your A/C With More Appliances At The Same Time Without Having To Worry. 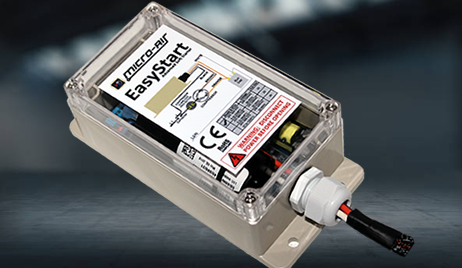 What EasyStart™ allows is the starting of your air conditioner on low voltage power sources. It electronically reduces the high power start-up current needed to START your AC, and permits you to both START and RUN your AC at the much lower voltage current needed to RUN it. EasyStart™ is a one-of-a-kind, custom-developed soft starter for single-phase motors. The standard version can support both 115-230VAC/50-60Hz motors, and the RV version supports only 115V/50-60Hz motors. It employs a 4-part start ramp sequence that is self-optimizing, resulting in the lowest possible start-up current. EasyStart™ delivers an electronic reduction of the start current required to turn on A/C—by 65 – 75%.” It eliminates the problem of compressor LRA (locked rotor amperage). It also has numerous specialized fault checks not found in any other soft starter to provide further protection for your compressor. EasyStart™ is the perfect solution to operate on smaller generators, inverters or limited utility power. It makes possible what was impossible before. It can also that allows an air conditioner or refrigeration compressor to operate on a generator, inverter, or limited utility power when it would otherwise not have functioned. It can also be applied to air compressor and fluid pump motors. The EasyStart™ 364 is capable of supporting up to a 36,000 BTU (3 ton) compressor. It includes a fully-weatherproof (IP65), flameproof, plastic enclosure with an integrated mounting flange and a 40" (1m) wire harness. Specialized models exist for various applications. IMPORTANT INSTALLATION NOTE FOR CRUISAIR® MARINE CUSTOMERS ONLY: When installing EasyStart™ into 220-240V SMX A-288/282/281 control applications that use the triac to switch power to the compressor, it is necessary to replace the triac with a relay. If the triac is not replaced, the EasyStart™ and any pump relay triggers may suffer damage and ultimately fail. A replacement relay specifically designed for this application is available at this link. Please note that this is not required for 115V SMX applications, and the triac is still safe to use. I was a little skeptical at first, but I'm very impressed with the EasyStart™ unit, it will start and run the AC with no trouble. More impressed with the customer service I recieved, even before I became a paying customer. I've been telling everyone I know about getting onne for their rigs! The EasyStart™ 364 Soft Starter Is A Game Changer! Our RV service Centre, Owasco, ordered the EasyStart™ from the distributor in Alberta (thanks Chris for emailing with me during my research) and we had it installed in late summer. We used it dry camping in Montauk, NY this fall. WE LOVE IT. We have a Honda i2200. So easy. It’s MAGIC! We were the first customer to have the product installed at Owasco in Ontario, I was so surprised! Everyone should have one :) Thank you to the folks at Micro-Air for such a great product & for the wonderful customer support & online tutorials. Can’t wait for April when we can pull our TT out from under the Canadian winter & get back to my happy place. Outstanding product. It deserves 10 stars. I purchased 2 EasyStarts, one for myself and one for a friend. DIY installation was easy. The compressor start up is very quiet now, no more 'THUMP'. Before installing the ES on my friends RV, we tried starting his 13,500 btu A/C using his single Honda EU2000i generator. With the Honda in ECO mode, the A/C fan running on low, we tried to start the compressor. The Honda went into overload and then disconnected from the load. After installing the ES (and performing the 5 starts on utility power) we performed the same test. The A/C started fine and the overload light on the Honda didn't even flicker. The EasyStart™ should be standard equipment on all RV air conditioners. Thanks again for a great product.